One of the recipes that I planned to make for my freezer cooking session was Hamburger Soup. I knew I was going to have to tweak the recipe a bit, but I tweaked it substantially when I replaced Worcestershire sauce for teriyaki sauce when I realized I didn’t have a gluten free version. I wondered how the family would like the recipe, but it was a huge hit! -In a skillet over medium heat, brown the ground beef with the onion and drain. -Combine the next 8 ingredients with the beef and onions in a slow cooker and cook on low for 5 to 6 hours. -Boil the noodles in a separate pan on the stove and add to the soup just before serving. Note–If you’re freezing the meal, don’t add the noodles until the day you reheat it to serve; otherwise they will become gummy. I doubled this recipe, and it filled my slow cooker almost right to the top. I shared this post at Tempt My Tummy Tuesday, Delicious Dish Tuesday, The Gathering Spot #43, Slightly Indulgent Tuesday, Tuesday’s Table, Waste Not, Want Not Wednesday, Gluten Free Wednesday, Tasty Traditions, Thank Your Body Thursday, Frugal Food Thursday, Natural Living Link Up, Cooking Thursday, Tots and Me in the Kitchen, and Show and Tell Saturday. 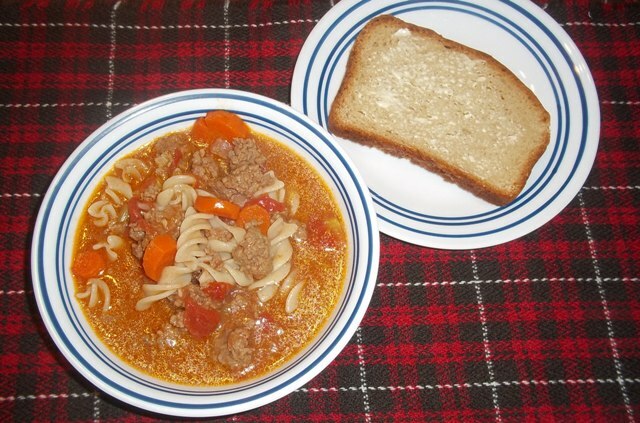 There is nothing like a great Hamburger Soup on a cold winter day like we have today, this looks delicious. Thanks for sharing your awesome recipe. This soup looks so good! I pinned it for later and would love it if you would link it up at my linky party Thursday at http://www.juliakendrick.com! I hope you have a great day! I have never made hamburger soup before, this looks really good. Thanks for sharing. I would love if you could stop by and share this at my weekly Kids and a Mom in the Kitchen linky. This looks great! Thanks so much for sharing it on Waste Not Want Not Wednesday. I’ve pinned it. I’ve never ever heard of hamburger soup, but it sure looks and sounds REALLY good! This looks delicious, thank you so much for sharing it with Delicious Dish Tuesday. I have featured it as my favorite recipe this week. We hope you come back and link up with us again! Thanks so much! I’ve linked up again this week. Your Pork Marsala looks delicious!